With the endless stream of new Websites and music information that fills the World Wide Web - music remains and even expands as an integral component of many people’s daily lives. With this in mind we wanted to provide some Websites that help shift and make some sense of music’s history and culture. The Websites listed will impart musical knowledge and appreciation for those looking to enjoy music more fully and discerningly. Manipulating sound and music through technological and electronic means has always played an important role in music history. MIDI (Musical Instrument Digital Interface) is an industry-standard protocol that uses varied electronic musical equipment to communicate with one another in order to gain a specific sound. Here, MIDI is implemented on several classical composers’ works, from the famed Brahms to the much-revered Tchaikovsky. Each composer is alphabetized and classified by national origin, and for the viewer’s convenience, each file is given its file size. And the site has a small section of downloadable jazz files with which to sample and a link to MIDI jazz files. If one is seeking to have some involvement with music rather than just reading about it, Music Resources on the Internet is an indispensable outlet that may tickle a music lover’s fancy. Newsgroups, organizations, publications and graphics are all at your fingertips. Although emphasis is placed on classical and jazz music, there is still good exposure for other musical genres. The Database of Recorded American Music (DRAM) pinpoints musical recordings and labels through a scholarly lens. A keyword search turns up material about composers such as Duke Ellington, as well as performers, instruments, record labels, publication dates and Library of Congress Classification. This site is interesting for those who like to explore while looking for old and new historical recordings to enjoy. Simplicity can say so much. 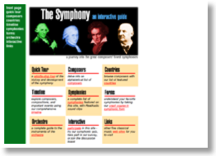 That’s how The Symphony: An Interactive Guide works. Part of the free academic-based platform ThinkQuest, the guide starts with a quick tour of the history of the symphony before branching out to specific categories which include the composers, their symphonies, orchestras, a link to other classical Web pages and a timeline. A handy guide for all classical music-minded listeners who prefer simplicity in their lives. Sheet music has played a pivotal role in the dissemination and enjoyment of music for over a century before discs began outselling this standard medium for music by the 1950s. Music For the Nation: American Sheet Music, a music division of the Library of Congress, focuses on sheet music of the 19th century, where American music blossomed into its own distinct genres, exemplified by minstrelsy, ragtime and choral music. Presented are more than 60,0000 American sheet music examples which are broken down into two categories, the pre- and post-Civil War eras. Operatic arias, piano music, sacred music, popular songs, and instructional books are just some of the genres documented on this Website. You can find mavericks in most, if not all, forms of music, from the obvious rockers the Beatles to the not-so-obvious jazz wizardry of Sun Ra. 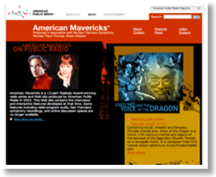 The Peabody Award-winning American Mavericks, produced by the American Public Media in conjunction with the San Francisco Symphony in 2002, has a Website that utilizes two media forms (radio and the Internet) to highlight the legacy of American recording artist mavericks in several series. Diverse composers such as minimalist Steve Reich and avant-garde artist Laurie Anderson are featured. The site also has other features such as Composers Datebook and American Routes, which share compelling stories, interviews and interactive features. The Website’s mission seems to succeed in educating us in and preserving iconoclastic artists work and featuring forward-thinking American musical innovators.